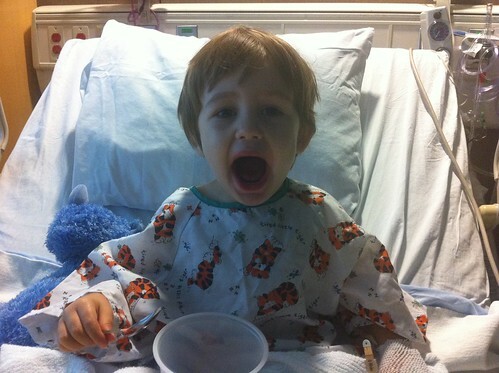 Hudson had his tonsils and adenoids out this morning. That’s a Tonsillectomy and Adenoidectomy, what the doctors refer to as a “T&A”. You’d think doctors would know that abbreviation. He couldn’t eat any breakfast do he wasn’t happy. We checked in at 8:45a and he was given anesthesia at 9:55a. Surgery was over by 10:25a and we could see him at 10:50a. He wasn’t feeling well but fell asleep in Gay’s arms after 15 minutes after being given pain-killers. He was hooked up to a monitor that checked his heart rate and the oxygen in his blood. When he slept, it dropped low enough once that they wanted him to spend the night in the hospital. An ambulance took him 2 blocks to Swedish hospital and we were in his room by 1:30p. We could have walked faster. This ambulance episode showed how bad our medical services are. The medic, trying to make conversation, told Gay that he’s “never had tonsils”. What kind of training do EMTs get that they don’t know that everyone has tonsils? Kelly brought Havana, Eva and a night bag for Gay at 4:30p and I went home with them, leaving Gay to spend the night with him. While at the hospital, his oxygen level was 97+%, which is normal, even while sleeping. So we think the anesthesiologist at the clinic over-reacted by recommending a night in the hospital. But it’s better to be safe than sorry. And apparently, unnecessary medical care is better for doctors to avoid potential lawsuits. 11/4 Update: We got the bill. It cost $1,654.60 for the ambulance ride (we have to pay $300 of that). It’s amazing how much money our healthcare system wastes. The only thing dumber than this are the people who don’t think it needs an overhaul. What a trooper! I remember having my tonsils out at around 5, and it was not fun. Be proud of him.